Ah Eastercon... your freebies, your signings, your dealers' room. 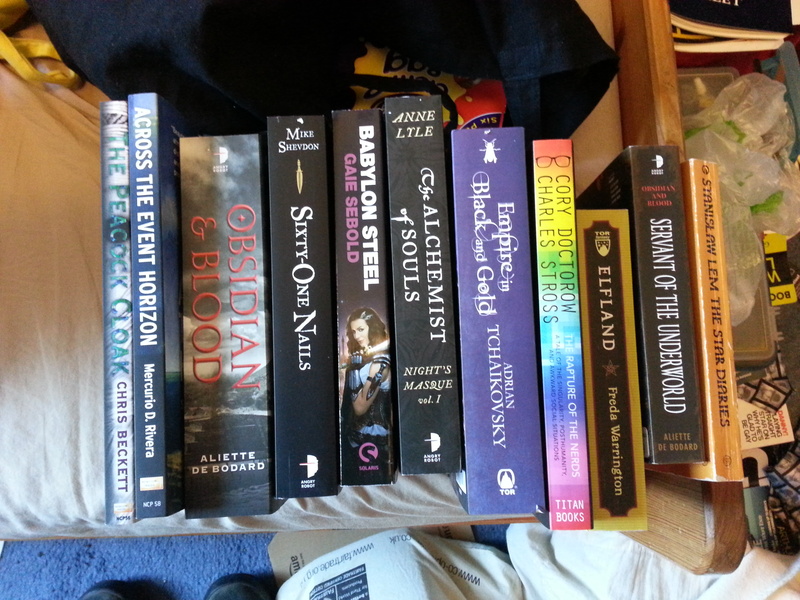 Such a wonderful supplier of additional material for my ever-increasing to-read mountain. Next up, Aliette de Bodard's Obsidian and Blood omnibus. I bought this as part of a 4-for-3 offer. I hadn't realised that the Aliette de Bodard book I'd picked up from the freebie table was the first of this omnibus at the time. Again, I love her short story work so am excited about getting to grips with something bigger. Babylon Steel from Gaie Sebold. From the cover, I wouldn't have picked this one up. From Gaie and the rest of the panel describing it as an interplaner brothel owning heroine how could I not? Cory Doctorow and Charlie Stross' Rapture of the Nerds - this one is defaced by Cory Doctorow. Only just launched I gotta say Cory didn't enamour me to it with his reading, but I have higher hopes than that. Permalink Submitted by Mercurio (not verified) on Tue, 04/23/2013 - 02:13. Sorry I missed you at Eastercon--I was only there Thursday through Saturday! Thank you for buying Across the Event Horizon. I appreciate the support and hope you enjoy it!